Offer birds a wonderful bit of seed from a fantastic feeder using the Big Top Squirrel Resistant Bird Feeder with Divine Blend Seed. 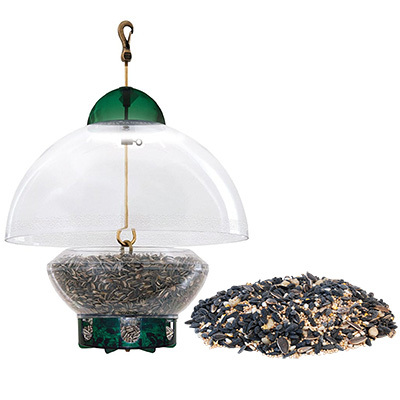 The lasting Droll Yankees Green Big Top Squirrel Resistant Bird Feeder has a generous 15" dome, which serves to protect seed from squirrels, large birds, and weather. The clear, polycarbonate feeder dome has an adjustable height to exclude or allow large birds to feed. Fill the clear reservoir, also made from durable polycarbonate, with 3 quarts of the included Divine Blend wild bird seed, and watch clinging birds feed from the eight stations. The top of the reservoir acts as an open dish, so a wide variety of birds may feed at once, and the item is simple to clean and refill by unhooking the reservoir. The green plastic hints on the cap and base enhance your garden, and this timeless unit hangs with its included hook with ease. Baffle squirrels and large birds while feeding smaller feathered friends a tidy seed blend with this Big Top Squirrel Resistant Bird Feeder with Divine Blend Seed. Lifetime guarantee on feeder.